Posted ByMichelle Van Doren, M.S., R.D. Summer is the season of abundance. The days are long, the plants are growing, flowers blooming, and the bees buzzing and dancing in the air. It can be easy to take this abundance for granted, but of course, the world turns, the seasons change, and once again winter will descend upon us. We are fortunate that we can preserve our abundant summer herb harvest for the winter months. Let’s talk about how to dry fresh herbs using a dehydrator. Our ancestors knew to prepare for the lean months of winter. The food was fermented, smoked, and dried, and the root crops stored away for the cold and dark months ahead. But it wasn’t just food that was preserved for winter—culinary and medicinal herbs were collected and dried to be available when needed even when the plants themselves were resting under the frozen winter ground. 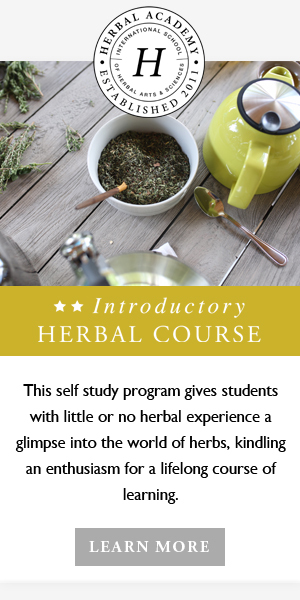 Historically, herbs were dried in small bundles, hanging in kitchens and attics. The natural beauty and aroma of this method are certainly enjoyable. But sometimes you may not have the space or the long drying time needed for hanging herbs. Or, if you experience high summer humidity like I do at my home in Virginia, it can be difficult to dry your herbs without loss due to mold and mildew. An efficient way to quickly dry and preserve the goodness of fresh herbs is to dry herbs in a dehydrator. Oven drying is one way to speed the drying process, but drying at too high a temperature can sacrifice plant quality, and it can be difficult to maintain the best temperature for drying herbs using a conventional oven. When you dry fresh herbs in a dehydrator, you can effectively preserve their medicinal and flavor qualities. Preheat your dehydrator with the thermostat set between 95 and 115 degrees Fahrenheit. If you live in a particularly humid climate, you may want to set your temperature as high as 125 degrees. If your herbs are damp, be sure to gently blot them dry with a towel to remove as much moisture as you can. Place the herbs on the dehydrator trays in a single layer. Small leaves can remain on the stems, but removing larger leaves from thick stems will shorten the drying time. Drying times will vary depending on the moisture content of your herbs. Loose, fine herbs like yarrow and mint will dry more quickly than moisture-filled herbs like plantain or comfrey. Expect 1-4 hours for most herbs. Check your herbs periodically for dryness. If you are using a stacked dehydrator, place the harder-to-dry herbs on the bottom and the lighter herbs on the top. It will be easier to remove the faster-drying herbs if they are on top. Be sure to keep track of which herbs are in each tray – it may be difficult to tell them apart when they are dried. You can dry any combination of herbs at one time as the flavors will not blend. If you are drying roots, scrub the dirt from them, pat dry, and cut into ¼ to ½- inch pieces. The roots will harden when dry, usually within 6 – 10 hours. The herbs are dry when the leaves crumble and the stems break when bent. After you remove the herbs from the dehydrator, allow them to cool before storing to avoid condensation forming. Temperature control. In general, the lower the temperature for drying herbs, the better the color, aroma, and medicinal value. Faster drying time. Using a dehydrator, most herbs can be dried in hours instead of days. Drying herbs in a dehydrator requires less space than hanging herbs or laying them out on racks and screens. Size and space. You can choose small dehydrators and work with small batches of herbs, or you can go large. Just remember to consider the space you have for using and storing the dehydrator. Noise. Some dehydrators can be quite loud during the drying process, especially those with fans that circulate the air. Extras. Fan or no fan, temperature control, and timers are some of the choices available when purchasing a dehydrator. Cost. Drying fresh herbs at home is an effective way to save money. You can spend less than $50 for a simple dehydrator to dry a few small batches or hundreds of dollars for a dehydrator capable of rapidly drying large batches of herbs. Read product reviews and talk to others already using dehydrators for their recommendations. Store your dried herbs in air-tight containers labeled with the plant and drying date. Although storing whole leaves takes more space, the herbs will retain their color, aroma, and quality better than crushed leaves. Be sure to keep them out of direct sunlight as well. Drying fresh herbs in a dehydrator is a great way to preserve the aroma, flavor, and medicinal qualities of your herbs. A dehydrator allows you to control the temperature and quickly dry your herbs, reducing damage and spoilage. Once dried, you will have access to your summer harvest throughout the year. Do you dry fresh herbs using a dehydrator? Do you have any tips to share? Michelle enjoys writing about her adventures in creating a homestead, cooking with whole foods, healing with herbal medicine, and living with mindfulness and joy.